The Rockefeller Foundation’s Informal City Dialogues project has translated select stories about Bangkok into Thai. Readers can now access a Thai translation of our first long-form report in the series, which explores how informal networks in Bangkok battled the city’s worst flood. Audiences can also watch our documentary films exploring informal housing and street vending in Bangkok with Thai subtitles. Explore this in-depth content in both Thai and English below. 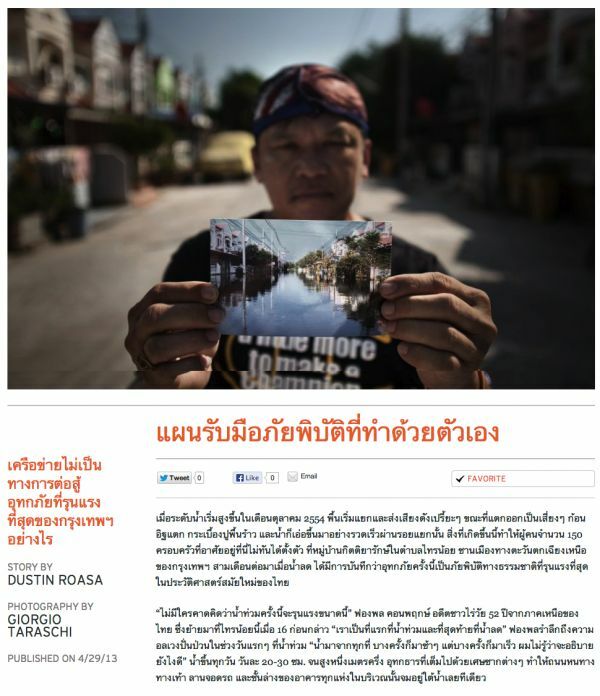 In the first Forefront story of the Informal City Dialogues, Dustin Roasa reports from Bangkok to recount the tale of how one neighborhood, isolated by rising water from 2011 Bangkok floods, the worst natural disaster in Thai history, improvised its own disaster response, and how other cities are readying their own informal networks for the era of superstorms. Read The D.I.Y. Diaster Plan in English here. See two stories from Bangkok unfold in our online documentary series, created with the award-winning filmmakers at Still Life Projects. Learn how informal housing is changing as more slum dwellers take the lead in upgrading or resettling their homes, and see how the street-hawking economy is transforming as a new class of vendors brings an unfamiliar set of skills to the scene. Access more Informal City Dialogues multimedia content here. Watch the video above with English subtitles here.